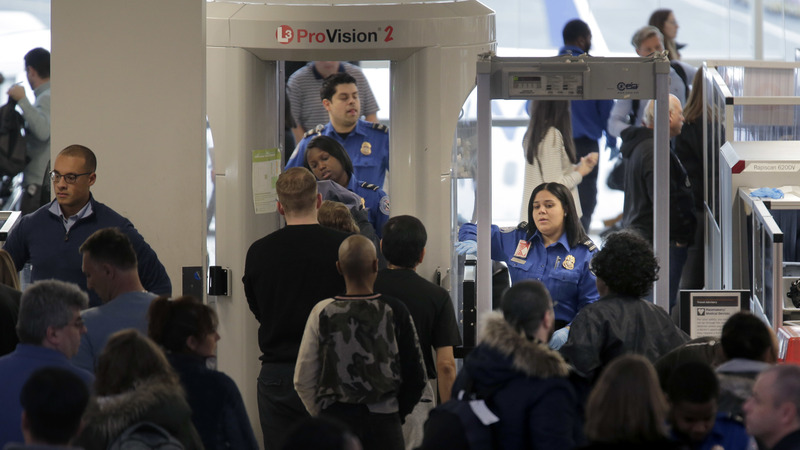 Wait times at major airports around the country remain mostly within normal range, according to the Transportation Security Administration, despite an increase in absences among agents working without pay. The agency saw a 6.8 percent rate of unscheduled absences on Monday, compared to 2.5 percent on the same day one year ago, according to a TSA statement released Tuesday. The number of call outs has continued to rise since the holidays as a result of the partial government shutdown, the agency says. Some airports have had to consolidate and slow operations because of the unexpected absences, leading to long lines and closed checkpoints. But the agency says the average wait time across the country remained within "normal TSA times of 30 minutes." Over 99 percent of passengers waited less than a half hour, while 94.3 percent spent less than 15 minutes in security lines, according to the agency. For PreCheck lines, the average wait stayed under the expected 10 minutes. "On a daily basis, the dedicated TSA men and women across the country who continue to report for work at airports across the nation demonstrate commitment and professionalism at the highest levels," the statement reads. While the TSA did not release staffing breakdowns by airport, due to security concerns, the absences have had an outsized effect at certain airports, as NPR's David Schaper reports. Atlanta, Houston, Washington-Dulles, Miami and Dallas-Fort Worth are among airports that have had to close security lanes and checkpoints because of a shortage of screeners. In Atlanta, travelers waited for almost 90 minutes in lines that snaked through the country's busiest airport. Elise Durham, a spokeswoman for the Hartsfield-Jackson airport, advised travelers to arrive three hours early. "Given the federal shutdown, we are beginning to feel a little bit of an impact, as it pertains to having some TSA workers who have not reported to work," Durham tells NPR. TSA data show Dallas Love Field experienced the second-highest peak wait times after Atlanta, though The Dallas Morning News reports the lines were unrelated to TSA staffing shortages. Honolulu, Newark and Miami had the next longest maximum wait times, all clocking in at just under half an hour. Peak wait times for PreCheck passengers were highest at the Seattle-Tacoma International Airport, at 14 minutes. Government workers, including TSA agents, recently missed their first paycheck of the year, as a result of the country's longest partial government shutdown. Federal employees are expected to receive back pay for hours worked during the shutdown, once the political stalemate ends. But TSA employees are among the lowest-paid government workers. Agents earn an average of about 17 to 20 dollars an hour, and many live paycheck to paycheck, as NPR has reported. MSNBC's Ali Velshi says some employees are calling in sick in order to work other jobs that pay their bills. "They're very frustrated," Velshi tells Here & Now's Jeremy Hobson. "They're hoping this ends soon." Meanwhile, food banks have stepped in to help furloughed and unpaid government workers, including TSA employees. And Schaper reports that air travelers across the country have been gracious, offering thanks to the employees, who are forbidden to accept tips. "It makes it easier to do what we have to do," an unnamed employee, who was not authorized to speak to the media, told Schaper. "There's nobody giving you complaints about you having to go through their bag. It just makes it easier so we can get you to your plane." The partial government shutdown has also proved costly to airlines. Ed Bastian, CEO of Delta Air Lines, told CNBC on Tuesday that his company expects to lose $25 million this month because fewer government employees and contractors are flying.